We are thankful to hear encouraging reports from our teammates and look forward to being with them again in January. 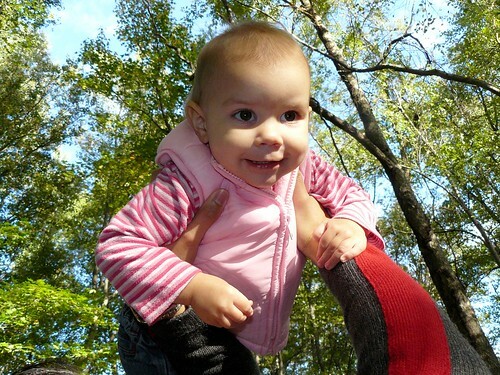 Dezsô's wife Marcsi (pictured above) had been in the hospital last week for surgery to remove a cancerous growth. Marcsi is very shy and wholeheartedly serves in the background. She rarely speaks up in small group or gives testimony in church. This past Sunday was different. Marcsi said that she felt like God was pushing her forward to share how He encouraged her through her time in the hospital. With Bible in hand, she flipped to verses that God had given to her in this time of testing. She gave thanks to God for the prayers of the saints and for God's gracious answer. It turns out that the surgery was successful and they believe all the cancer was removed. Please pray for Marcsi (March-ee) that her precautionary visit three weeks from now would reveal that there are no further signs of cancer in her body. On Monday nights, our teammates, Brenda, Val, Roger, Heidi and Rachelle are continuing our English community classes in Petôfibánya. They had 6 people stay afterwards last week for the optional Bible study. 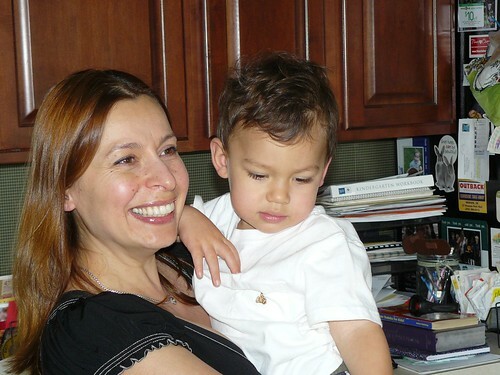 Csilla, a mother of one of our previous students from English camp brought her son and a visitor from Canada. Please pray for Csilla as she has consistently come and is open to hearing more. Teenager Gabi K, who was baptized last week (see previous blog entry) attended an English Camp Reunion party. At one point in the night, each camper was asked to share a bit about some things that have been going on in their life since camp. In front of everyone, Gabi said, "I was baptized." This was a bold move on his part and we are encouraged about his openness and willingness to share about these changes in his life. 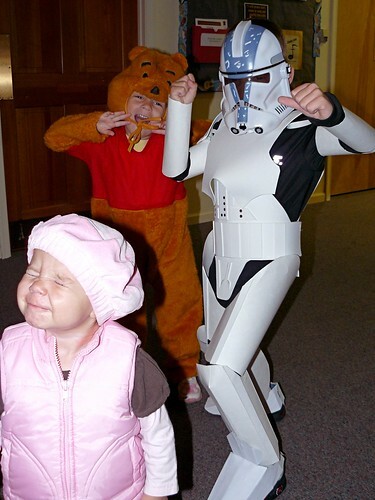 Above: Our wacky kids at Brandywine Valley Baptist Church's harvest night for kids. Above: A visit from Sam, Tania and their son Matthew. 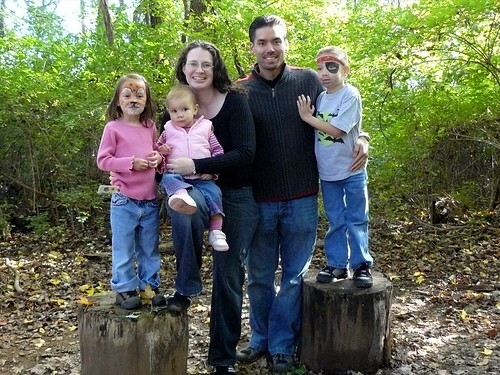 We spent some quality time with Allen's older brother Sam and his family who live in DC. Above: Spending some free time at the Iron Hill Museum. 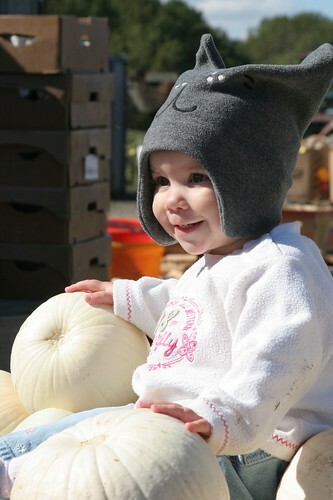 Benjamin and Elianna got to try their hand in archery, paint a few pumpkins and gobble down cotton candy. Above: Last Sunday, married couple, Gábor and Hugi followed Jesus in baptism! Hugi began attended our English program in October 2006 and began staying after class for our optional Bible studies. Soon after, Hugi responded to an invitation to church and was saved. Her husband Gábor also began attending english classes and Hugi convinced him to attend church. 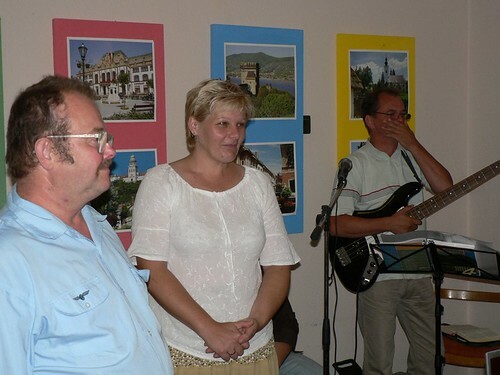 "Hugi and her husband Gábor came to our worship service. This was Gábor's first time stepping foot in any church service (what a privelage for us!). For those of you who have been praying for Hugi's husband Gábor, God is answering in a big way! I had a chance to speak to him after service and he openly shared where he was in regards to faith. Gábor said, 'Honestly, my family thought making money was the most important thing in life. They never talked about God. I left home when I was 18 and since that time have sought to provide for myself. I've made some bad decisions in my past along with the good ones. I now understand that I need to change, but I'm not sure how to change. Now I am open to reading the Bible and seeking.' I spent some time explaining the basics of the Bible (he was holding Hugi's Bible in his hand). Please pray that he will begin reading this week and begin understanding God's truth by His grace." Now, almost exactly a year later, two lost people have been found! Praise the Lord for the journey he has taken Hugi and Gábor on to hear His good news of salvation through Jesus Christ! 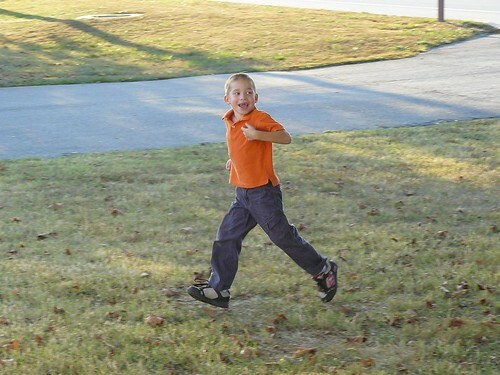 The above pictures visually illustrate the journey we have had with Gabi K. We first met Gabi when he attended a children's Bible study that Miki led in 2003. We lost contact with him for some time and then we reconnected with him through our Sports Ministry. 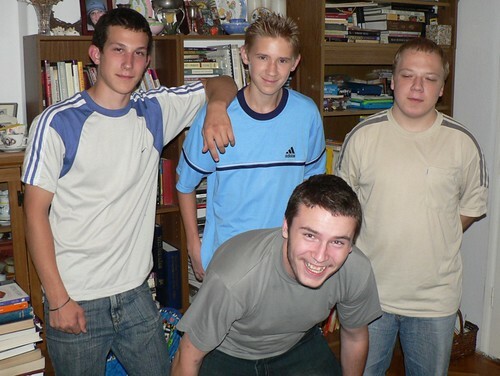 He began attending a Bible study with the other teens at our house and continued to learn more about faith in Jesus. 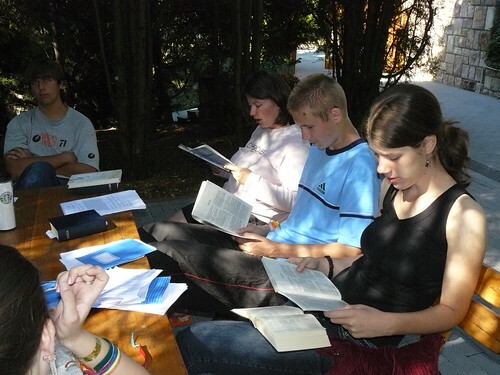 In 2007, Gabi attended English Camp where he was encouraged to begin living out his faith. He began attending church soon after camp and as of last week has been baptized. Above: All those baptized last Sunday seated from L to R: Mária, Hugi, Gábor, Lidia and Gabi K.
We praise God for the fledgling church plant in Petôfibánya gaining traction and increasing in number by His grace. It is of utmost importance that these new members become founded in God's word. 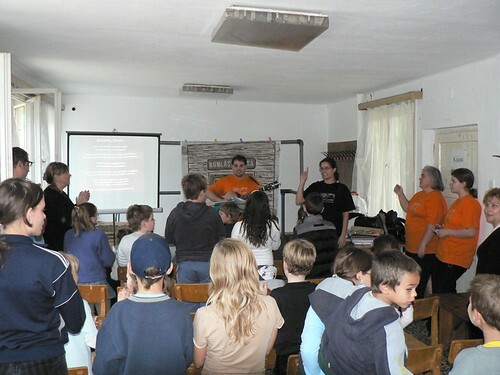 We are thankful for Peti committing time and resources to our first Bible school in Petôfibánya. Every other week, Peti is systematically moving these new believers through foundations of our faith in Scripture. We are thankful for the hospitality of those that hosted us in their small group over the past week. We have been privileged to meet more new people in the BVBC family who welcomed us as friends. 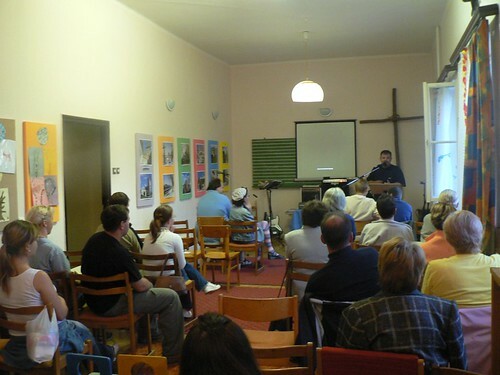 We continue to seek more opportunity to share about what God has been doing in Hungary. If you or your small group would like to invite us, simply fill out this online request form. Above: Like manna from heaven! God has provided bags and bags of high quality clothing to Sharon to distribute to our family and four other missionary families. We praise God for his constant care for us and these 'who would have thought' surprises on our walk with Him. 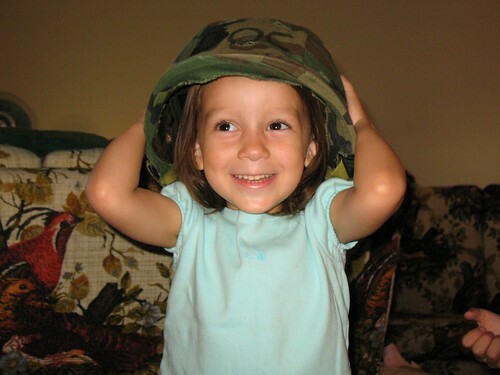 Above: Elianna trying on Poppop's head gear. 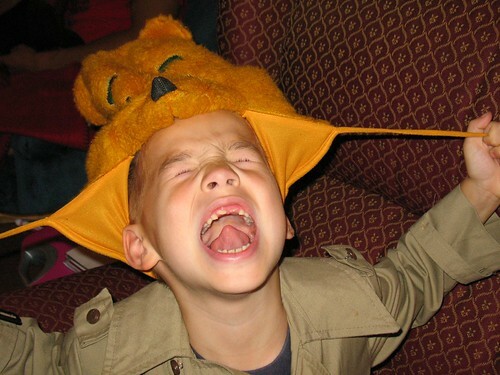 Above: Ben trying on Kira's head gear. Above: Snuggling with Kira-one of my favorite things to do. Above: On Friday, we joined the cousins for a day trip out to Linvilla orchard in PA. We were concerned about rain the night before, yet God surprised us with a beautiful pumpkin picking day. 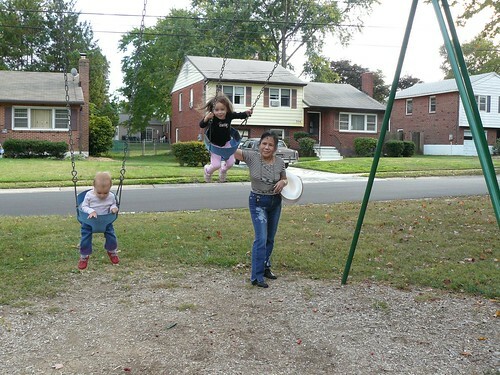 Benjamin and Elianna love spending quality time with their cousins. Above: I'll take the cute one on the very top. 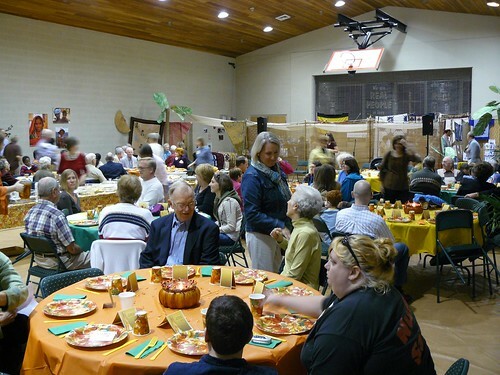 Above: On Saturday night, we participated in a mission's dinner at our church. Many of the home grown missionaries from BVBC happened to be in Delaware at the same time. Ten years ago, the majority of those on the panel were attending BVBC and just sensing the call from God to missions. Now, years later we rejoiced in hearing how God had taken ordinary men and women to do extraordinary things. He deserves the glory! We joined the panel discussion and were able to give some highlights of how God is building His church in Petôfibánya. We are very blessed to have a church that seeks to equip and constantly encourage us on the field. 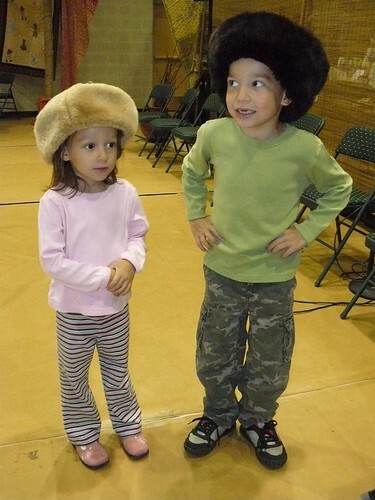 Above: Ben and Elianna trying on Russian hats (compliments of 'Ed bácsi') that were used in an opening skit. This skit communicated the remaining segments of unreached people throughout the world that have limited or no opportunity to hear a clear presentation of the gospel truth. 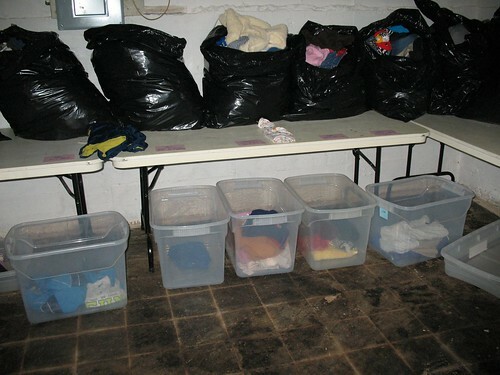 On Sunday morning, Sharon commented to me that we were in need of clothes for the kids for winter. With three growing kids, and the mixture of boys and girls, clothes don't last very long. God surprised us with provision before we even began to ask! A gracious member of BVBC approached Sharon and happened to ask her on the same day, "How are you doing with clothes for the kids?" 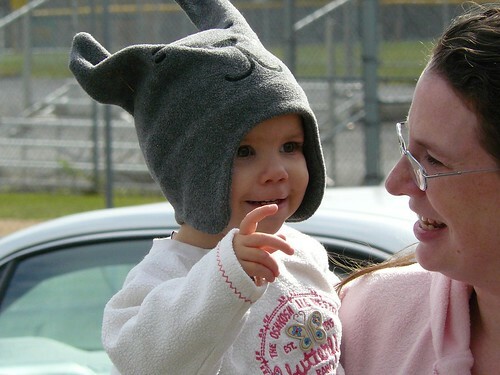 Through this friend, all of children will be able to obtain winter clothing for free. Thank you God and thanks to those who extend help in Christ's name. You may recall, that we were waiting for a permit as foreigners to finalize the buying of the house in Petôfibánya. We praise God that those papers have come, and we are official Hungarian home owners! We could not have done this without the gracious gift of a personal loan from one of our supporters. We are thankful for God protecting us through the whole convoluted process and giving us success in finding the home and buying it before we left for furlough. You may also recall that we were waiting for results from two tests related to the threat of cancer in Sharon. We have received the results of one of those tests (a spot removed from her leg) and there are no signs of cancer. Because of communication difficulties, we have not been able to obtain the results of the second test. Even still, we rejoice in the results of the first. In Sunday night's service at BVBC, there is a time when we briefly greet those seated around us. Since I knew those sitting right next to me, I turned and greeted a young couple two pews behind me. Of course, in this brief time, only names are exchanged. We sat back down. Sharon and I were called to the front with other BVBC missionaries to speak about our ministry and how God leads us in building bridges. After service was over, the young man two pews behind approached me. It turns out that his mother's maiden name is Szabó. Why is that important? Because Szabó is Hungarian! John continued to explain that he understands Hungarian and can even speak it a bit. Hungarian is such a unique and unpopular world language that these type of meetings are just...unexpected and amazing. I couldn't help but laugh at this obvious sovereign appointment by God. János..."Örölök hogy megismerhetünk!" 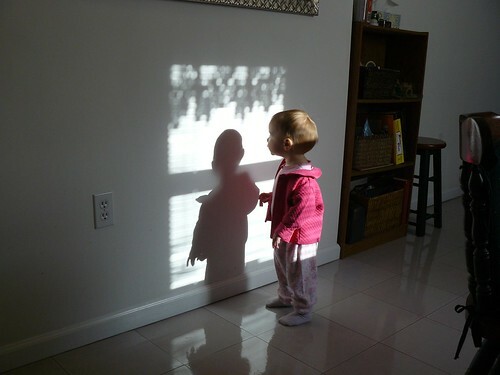 Above: Kira enjoying her shadow at Grandpa's house. Above: Getting used to America. This waiting room space is something we are not used to in Hungary. Most waiting room spaces we encounter have you no more than an arms distance away from furniture or another waiting person. 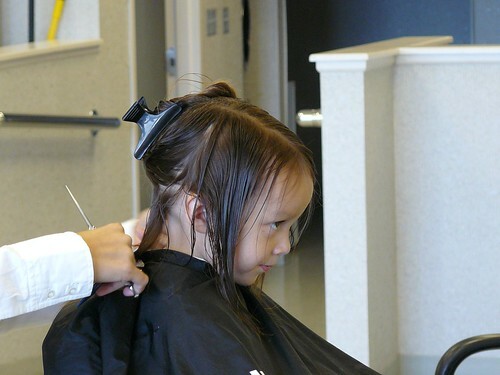 Above: Elianna getting her FIRST haircut. That's right. After four years of growth, there was finally enough to trim. I sat next to a lady with a 2 year old that already had four haircuts. Hair grows slowly in our family. 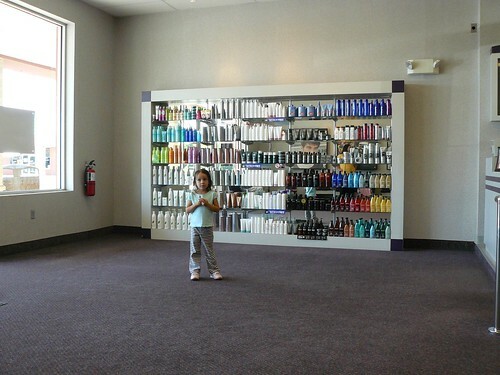 At least we save on hair cutting costs. Above: The joy of a 24 oz parmesan cheese dispenser. In Hungary, parmesan comes in small paper packets or salt saker size containers. 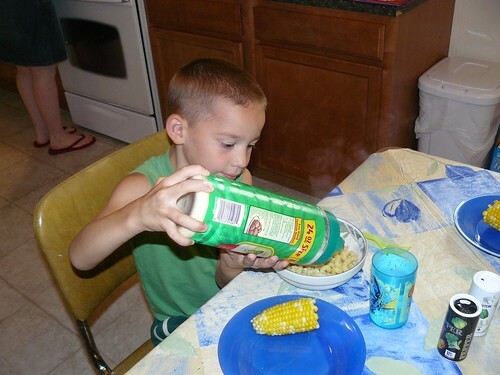 For now, Ben can load up his pasta without fear of leaving his family empty handed. Above: We are thankful to God for this special time in the US with family. When in Hungary, people often ask us, "Do you miss the US?" I always respond the same way. I don't really miss the US, but I do miss my family. 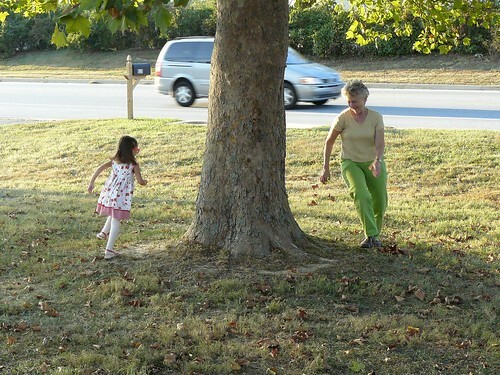 We are cherishing this brief season in our lives where our children can walk, run and play with their grandparents. 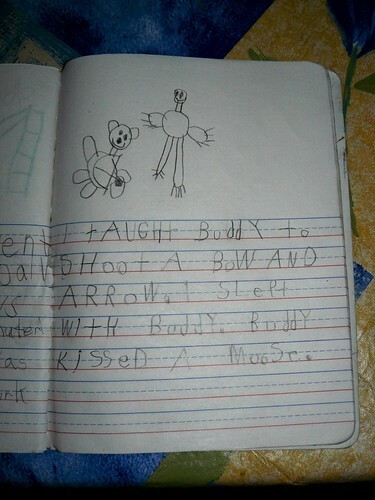 Above: Ben's journal entry for school. Ben is continuing to improve in reading and writing. Since he knows Hungarian and can now understand when we spell out words, we can no longer keep secrets from him. "Let's go out for i-c-e-c-r-e-a-m."
Above: Last week, we got to visit Dianna at our home church. Ben and Elianna were thrilled to point out different people from Petôfibánya in a photo book about our ministry. Above: VBS reunion. 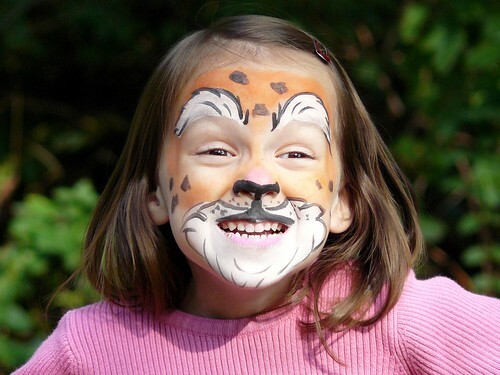 As many of the kids who attend our VBS do not attend church, the team decided to put together a VBS reunion on Saturday. Praise God that over 15 kids showed up! The children sang camp songs and recalled what we learned in VBS earlier this year. 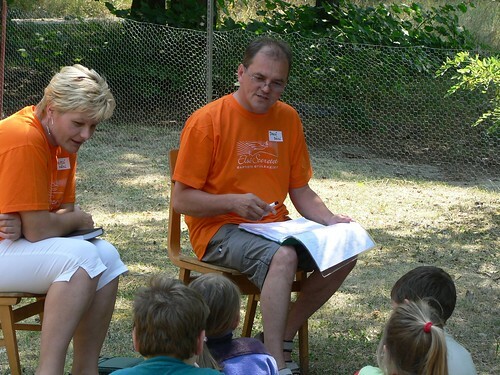 This is a great way to maintain important relationships with the kids and build their understanding of the gospel. Above: Peti (pet-ee) preaching every other week in our church. I am thankful to see the congregation increasing in number in our absence. 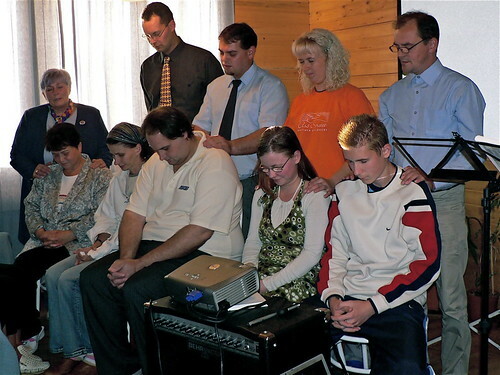 Teenager Gabi (gah-bee), seated next to Zoli (blue shirt) will be baptized this Sunday along with Mária (pink shirt). Hugi (who-gee) and Gábor (Gah-bor) who were initially drawn into our fellowship through the English program will also be baptized this Sunday. Please pray as Miki prepares this special baptismal service. Pray for those being baptized to be blessed and that more would come to know the gospel through their testimony. Most of them are the first in their family to become Christians. 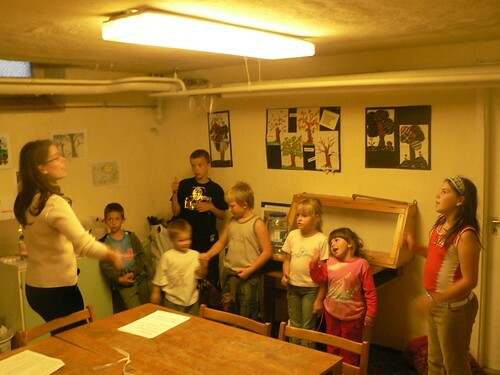 Above: Faithful teammate Janka, hard at work downstairs with the kids. Above: Dezsô's wife Marcsi (March-ee) has just gone through surgery today related to cancer. Please pray for her that the surgery will have successfully removed all dangerous cancerous cells and that her body would be strengthened and healed. Marcsi will be in the hospital for a few days following her surgery. I think we need to stir up more complaints than compliments today. When was the last time I was a guest in a sinners house? When was the last time I made an effort to reach out to someone in my community who was well known to be a sinner, but to whom God was leading me to lead to Jesus? Today, seeking as Jesus sought in the above verse has become a bad word. Instead of seeking, we should 'pay no attention', 'mind our own business', 'leave them alone'. This cultural mindset of 'to each his own' has threatened to lead us to put aside our calling as Christians. Of course we want to save, and we are very willing to respond when someone seeks after us for answers. But are we willing to take the first, uncomfortable and counter cultural steps of seeking to save someone who is lost? To be like Jesus means to be someone who is seeking the lost, and leading them to Jesus to save the lost. Yesterday, in front of the grocery store, a man who just 'didn't fit in' greeted me. 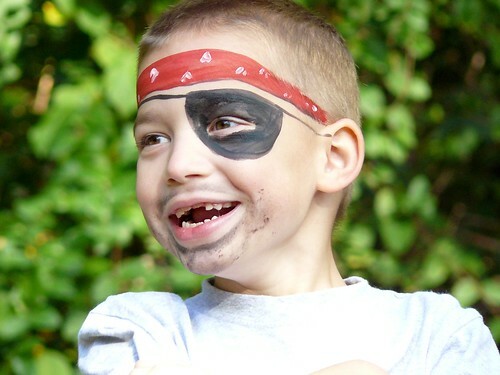 His clothes were tattered, his face unshaven. He had one leg and a metal ratchet like stub attached to his body. Because of his leg, his walk was loud and uneven. He grunted. He intently made eye contact with me. When he greeted me, his voice was coarse and bold. I responded with the normal, "Hi, howya doing", as I walked into the store in front of him. 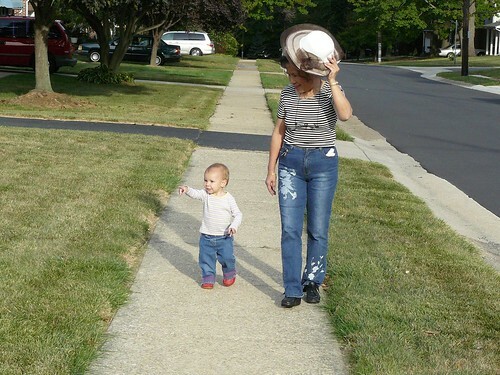 He continued to answer boldly, "What can I say, I used to have two legs and now I only have one. What the @?!!. Nobody cares anyway. I could complain but nobody cares." He was obviously angry. He was obviously rejected. He was obviously feeling hopeless and alone. He seemed like he wanted to talk, to me...a complete stranger. But I was not willing to talk to him. I accelerated and made my way down another aisle to complete a different agenda as he faded away in a grumbling mumble to himself. I am ashamed to say that in that brief meeting, I failed to be a seeker as Jesus was a seeker. I failed to see God's purpose in my trip to the grocery store. It was not only to buy milk and cereal for family. I was to live as His ambassador and to extend hope to this hurting man. The man could have rejected my desire to reach out to him, or I could have planted seeds that would turn him to received God's message of hope in Christ. I will never know because I was seeking milk and cereal and not seeking the lost. Father, forgive me when I fall short of loving as I ought. Thank You for the privilege of being Your ambassador on earth, to seek and to save the lost by leading people to Your Son, the Messiah. Transform me, that I would live my day as a seeker, seeking you with all of my heart and seeking the lost that I might help them find salvation through Jesus Christ. Thank You for cleansing me of all my sin through Jesus and for giving me the power to do Your will through the Holy Spirit in me. Help me today to listen to You, to draw closer to You and to honor you in all that I am.